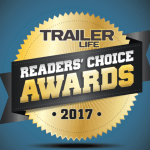 The 6th annual Trailer Life Readers’ Choice Awards are out and Lance Camper of Lancaster, California has taken home the prize for best travel trailer, while anything from Forest River came in second and Jayco finished third. The accolades should come as no surprise as our long time partner was recognized earlier this year as the top selling composite travel trailer in the 14′-23′ category by RV Business Intelligence Solutions. Congrats to all our friends at Lance on a job well done!